I love greasy, juicy hamburgers along with an abundant mound of generously salted french fries. I'd eat them a couple of times a week except for the fact that I'm not interested in gaining 40 or 50 pounds while diminishing my life expectancy. I lost a full head of hair years ago, and I wouldn't mind getting it back, but not at the risk of popping pills that have multitudes of side effects that those TV ads warn us about. No, I can't have it both ways, but apparently major league baseball thinks it can. Three years ago in a move that slows down ballgames MLB introduced replay review - an innovation requiring an average of about a 2 1/2 minutes per review - in order to ensure that plays on the field would be accurately called. Last season fans waited through approximately 1,500 reviews, or about five every eight games. So last week it was time to speed up things. In a laughable countermove, the four-pitch intentional walk, which occurred in about one-third of games last season, took its place in baseball history. So which is it, fellas? Slower or faster? You can't have it both ways. Stated another way, fans spent almost 64 hours last season while the blockheads in blue with the headphones standing on the sidelines waited for word from New York to determine the final outcome of a particular play. Depending on which manager issued the challenge, the paying customers are entertained by the Beatles' "Let It Be" or Sheryl Crow singing "A Change Will Do You Good." Whoopee! In reality, the tossing of four balls for an intentional walk already was a speed-up mechanism in the sense that the pitcher didn't have to look for a sign from the catcher; he took less time to deliver the pitch; and he gave the baserunners a cursory glance. Furthermore, the unexpected - a baseball staple and an intriguing part of the game - always was a possibility when four balls were lobbed from the mound. A wild pitch wasn't unheard of, nor was an offering a bit too close so that the hitter put the ball in play. Both occasionally happened, adding to the special quality of the game. You never know. Barry Bonds was walked intentionally 120 times in 2004. As Giants fans booed, hollered and basked in their abuse of the opposing pitcher and manager each time, there always was a slim chance that the enhanced Bonds would reach out and deposit a slow ball into McCovey Cove. The walks also resulted in an astounding .609 OBP that season and an OPS of 1.278 which created all kinds of conversation and interest. So eliminating the four-pitch intentional walk not only is a misguided excuse to speed up the game, but it also detracts from the drama of baseball. Sort of like blaming Smokey the Bear for forest fires. A century ago, big league ballgames took about an hour and 47 minutes. Today they last a few minutes over three hours, or a bit shorter than a pro football game. which, according to Quartz, averages 3:12, of which about 11 minutes features game action. There are two obvious reasons why a ballgame's time has almost doubled. One is television. Franchises couldn't survive - and millionaire ballplayers wouldn't exist - without the national and regional TV revenues. On the other side, the video people need big-time advertising dollars to meet their costs, and baseball affords numerous money-making breaks between innings and during pitching changes. In addition, prior to TV, pitchers were expected to start and finish every game. The concept of set-up men and closers didn't appear until decades later. Bullpens had no flame-throwers. They were occupied by failed starters, declining veterans, and rookies who needed to prove themselves. Last season Chris Sale led the American League in complete games with six. Johnny Cueto was the National League leader with five. Sale's complete games averaged just over 2 1/2 hours. He dispatched the Astros on May 11 by a 2-1 score in two hours, 11 minutes. Similarly, the average time Cueto required for his quintet of complete games was 2:32. Hence, if the commissioner wants shorter games, bring back the complete game, and limit the number of pitchers a manager can use. Of course, that is pure folly. Effective bullpens are a prerequisite for successful teams, and fans love to see an Aroldis Chapman and others enter a game with their 100-mph fastballs. It's even more exciting when one of them is hit 400 feet. If MLB is looking for an antidote for the three-hour game, maybe limit the number of warm-up pitches allowed to a reliever. If you have four or five of these guys coming into every game - eight or ten combined for both teams - give them four pitches off the mound instead of eight. After all, they already have thrown 20 or 30 pitches in the bullpen before being summoned. That's enough to be ready to compete. While we're at it, get rid of replay review. Human error is part of any sport, be it a dumb move by an athlete or a blown call by an official. 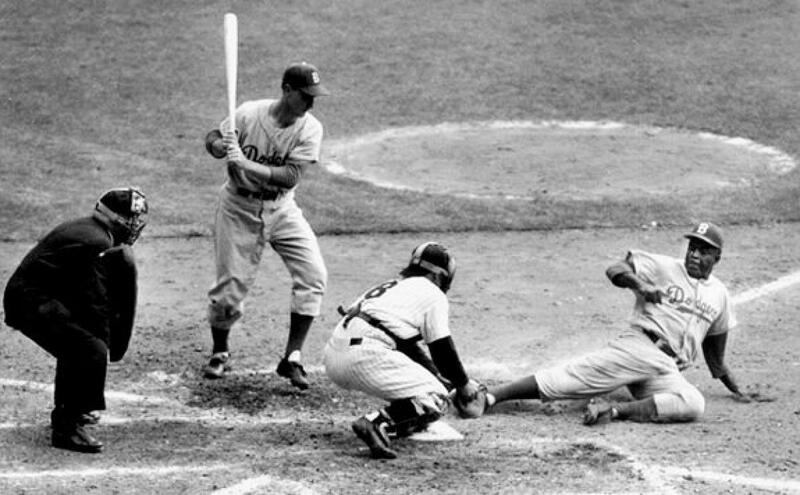 Jackie Robinson was out on his steal of home in the first game of the 1955 World Series. although the umpire Bill Summers ruled otherwise. Jackie knew it. Yogi Berra, who went absolutely berserk, knew it. In the long run, it made no difference because the Yanks won the game, although Brooklyn won the Series. The call stood and resulted in one of the most iconic moments (and photographs) in baseball history, all because of the intrepid Robinson and human error. It all would have been erased with replay review. Good teams overcome adversity. During a long season, the calls even out. Excitement doesn't mount when a game is interrupted for up to six or seven minutes while faceless and nameless people hundreds or thousands miles away make a final decision. What beguiles older fans like myself is baseball's consistent self-consciousness about how much time fans will spend at the ballpark or in front of their TVs watching the games. The executives keep making excuses for the pace of the game. You don't hear the NFL commissioner moaning about the slow pace of his sport. Try sitting in Soldier Field on a frigid December afternoon watching a horrible team idled by yet another TV timeout. The empty seats last season spoke for themselves. Yet where was the outcry to shorten the game? Baseball's excuse is that younger fans find the game boring. Let's assume that the honchos at MLB know how many kids come to the park as well as follow their teams on TV. My own research, arrived at by attending a couple of dozen games each season, is that kids at Sox Park have a great time. Whether it's actually watching the game, looking for themselves on Fan Cam, dancing between innings to hip-hop, cheering the sausage race, or screaming for a free t-shirt that's thrown into the seats, the crowd at Sox Park - meager as it might be - includes plenty of young folks and families. My Beachwood colleague Jim Coffman, president emeritus of the Welles Park youth leagues on the North Side, e-mailed to me, "Last year we had more than 1,500 kids participate in our baseball and softball programs. This year we will have more. Youth baseball is alive and well in the big city." Drive past just about any park this summer at 6 o'clock in the evening, and you'll see the diamonds full of kids playing ball. Call it the Cub Factor if you wish, but the bottom line is that kids appear to be playing baseball just like they have in years past. Maybe it's time that MLB sheds its inferiority complex and celebrates the three hours that folks can spend at the ballpark with friends and family, watching a ballgame, eating a hot dog, drinking a beer, and enjoying a Sox victory. Well, maybe that's hoping for too much. But piling grilled onions and pickles on that red hot ain't so bad.